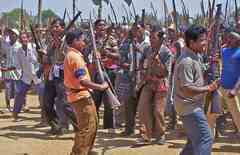 India’s controversial anti-Maoist vigilante group, Samajik Ekta Manch (SEM), has announced it will disband. Set up in December 2015 with the stated goal of ridding Chhattisgarh’s Bastar region of Maoists and supporting the police in their work, the SEM had claimed to be a peaceful initiative. Nevertheless, it has been accused of carrying out a violent campaign against rights activists and journalists in Bastar, the center of India’s Maoist conflict. In one recent incident, a journalist was hounded out of Bastar for her articles on alleged police atrocities; in another incident, an Adivasi (tribal) activist’s face was smeared with scalding, corrosive grease for campaigning against extra-judicial killings and rapes by Bastar police (Scroll.in, Feb 8; The Telegraph [India], February 29). Police patronage of SEM has been evident, with SEM leaders boasting of their “official connections.” Their weapons have been traced back to police armories, according to Bibhu Prasad Routray, an expert on the Maoist conflict. Meanwhile, senior police officials have attended the group’s public meetings and were captured on camera admitting to “facilitating” and supporting the SEM’s work (India Today, April 14). When India’s decades-old Maoist conflict erupted violently in north Bengal in 1969, the government was successful in crushing that uprising through the use of force, but the armed struggle spread to other parts of the country. The heartland of the conflict has since moved, and it has gone through phases of escalation and de-escalation, with the current phase the most violent. The CPI-Maoist’s aim is to capture state power. It claims to represent India’s most deprived— Adivasis, Dalits (former ‘Untouchables’), and the rural poor. Its espousal of Adivasi causes is partly motivated by its ideology, but has also developed because its guerrilla strategy requires it to operate from hills and forests, which are inhabited by the Adivasis. It needs their support for survival and fighters, hence its articulation of Adivasi issues. The Adivasis, meanwhile, are aggrieved over the loss of their ancestral lands and access to forests, depriving them of their homes and means of survival. Dams and mining projects have displaced millions. While most Adivasis prefer non-violent activism to a violent confrontation with the state, state repression and the branding of these campaign groups as ‘Maoist fronts’ has pushed a growing number of Adivasi youth to join the Maoists. The State’s strong opposition to the Maoists – evident from its willingness to use force, including “any element of its national power” against them – is a response to the Maoist’s own aims and violent methods (The Telegraph [India], October 18, 2014). At the same time, however, the land that the Adivasis inhabit, swathes of which are under varying degrees of Maoist influence, is mineral-rich. Industry watchdogs have lamented that Adivasi protests and the Maoist insurgency in “mineral rich heartlands” are disrupting the investment plans of mining companies (Frontline, February 13-26, 2010). The state’s stepping-up of counter-insurgency operations, and continued reliance on militias despite their illegality, seems aimed not just at eliminating the Maoists, but at forcing the Adivasis off their land in order to free it for exploitation by mining companies. Business interests are also believed to lie behind the recent spurt in vigilante groups in Bastar. VSS took shape soon after Chhattisgarh government officials signed memorandums of understanding over a steel plant and a railway line (Indian Express, June 4, 2015). Adivasi vigilantes may have effectively contributed to the weakening in recent years of the CPI-Maoists, which has lost several leaders and cadres. However, the state’s use of vigilantism may also be fueling the Maoist conflict. State backing of vigilante torture and killing has deepened Adivasi disaffection with the state and it is the Maoists who benefit from this alienation. There is palpable fear in Bastar that the days of Salwa Judum are back. It is doubtful that the dissolution of the SEM marks the end of vigilantism in Bastar. If history is any guide, state support for such groups will likely ensure it continues, albeit under another name. Author interview with Bibhu Prasad Routray, an expert on the Maoist conflict and a former Deputy Director in India’s National Security Council Secretariat, New Delhi, June 25 2016. Government of India, Ministry of Rural Development, Committee On State Agrarian Relations and Unfinished Task of Land Reforms, vol. I Draft Report. Available online at www.rd.ap.gov.in/IKPLand/MRD_Committee_Report_V_01_Mar_09.pdf (accessed on July 3).